The Philippines is a unique destination where you can have it all; from luxe resorts to indulgent spa experiences or private island picnics. It’s a country that blends modern culture with a Spanish Colonial past, but what really sets the Philippines apart is the abundance of spectacular beaches and unspoilt natural attractions. That are over 7,000 islands, so take your pick of location for the perfect Philippines wedding or honeymoon. This accessible destination is only a seven-hour flight from Australia. English is widely spoken there, and the locals are renowned for their warmth and hospitality. It’s also a place where you and your guests can enjoy affordable luxury, indulging in high-end shopping to spa treatments and relaxing stays in exclusive resorts – against some of the world’s most exotic backdrops. The capital, Manila, is your launch pad to amazing experiences as you kick off your celebrations in a city that never stops buzzing. Renowned as a shopping mecca, it’s home to some of Asia’s most impressive malls and vibrant markets. But Manila is still a city with soul; for a unique glimpse into its Spanish Colonial past, take a walking tour of Intramuros – the 16th-century, walled-city built around the grand Manila Cathedral. Filipino fare features a blend of South-East Asian and Spanish influences. Explore the local cuisine in Manila, trying local specialties such as adobo at Abé restaurant, or fine fusion food at Chef Laudico’s Bistro Filipino. If swimming in turquoise waters, snorkelling with brilliantly coloured fish, exploring secluded lagoons by kayak, or getting dropped off on an island for a private picnic is your style, journey to the region of Palawan. The award-winning El Nido eco resorts offer three island escapes in pristine paradise. For another stunning backdrop, head to the rolling green hills and fine white sand beaches of Bohol. Eskaya Beach Resort & Spa offers a tranquil retreat in a boutique setting, with one of the most stunning infinity pools you’ll ever see. Bellarocca Island Resort and Spa in Marinduque offers another intimate escape: you’ll be blown away by its luxury villas, inspired by Greek Santorini architecture. And if you’re in the mood to party, head to Boracay – its nightlife is as famous as the island’s picture-perfect shoreline. The opulent Shangri-La Resort Boracay, with its luxe villas, famous Chi spa and chic bars will enable you to celebrate in style. 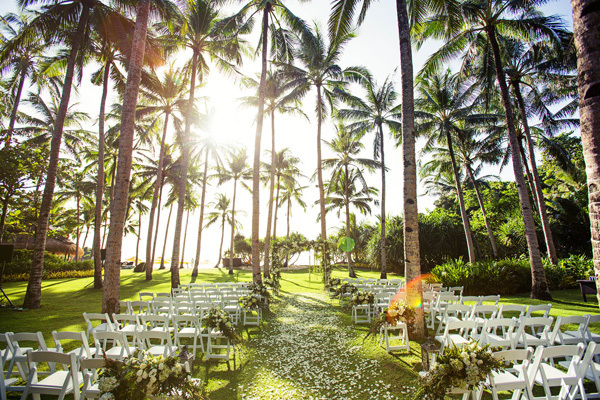 To find your dream Philippines wedding venue, visit our exclusive directory of stunning resorts and hotels that specialise in destination weddings. Check out some real life weddings of couples who chose to marry in Asia. Header image: Shangri-La’s Boracay Resort & Spa.